The article cites a broad number of participants in the reforms, quotes Transparency International, and also refers to CRRC's research on Judicial Independence. Find the link to the article here. "From the case studies, 10 factors emerge that help explain Georgia's achievements to date: exercising strong political will; establishing credibility early; launching a frontal assault; attracting new staff; limiting the state's role; adopting unconventional methods; coordinating closely; tailoring international experience to local conditions; harnessing technology; and using communications strategically. 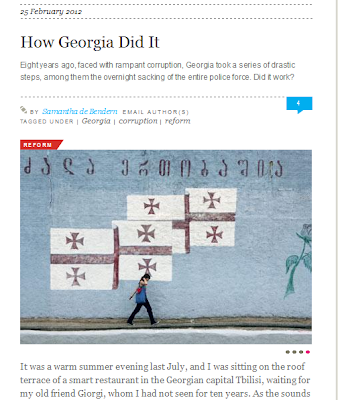 While many of these factors may seem obvious, the comprehensiveness, boldness, pace, and sequencing of the reforms make Georgia's story unique." 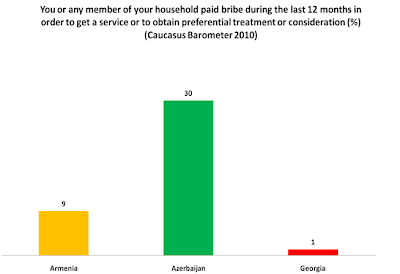 Comparatively little data was cited in the report (link is here), but our Caucasus Barometer data certainly corroborates that there are huge regional differences. To give good access to our data, we have now made a collection available on our website – more than 80 pages of tables, that offer a comprehensive overview over the years. This includes data from CRRC and other organizations, and thus should be a useful resource. To access this data collection, please click here.